The Tactical Negotiations Unit (TNU) was created to respond to and diffuse critical incidents involving persons who are in crisis, suicidal, barricaded, or engaged in hostage taking or terrorism activities. Specially trained and equipped negotiators use active listening skills, persuasion, and problem-solving techniques to resolve incidents peacefully, while continually providing the incident commander and tactical team with gathered intelligence should a tactical solution become necessary. The unit is headed by a Captain and is comprised of 16 individuals, which provide two teams of eight in order to manage multiple or protracted events. Team assignments include Team Leader, Primary Negotiator, Secondary Negotiator, Information/Intelligence, Scribe, Tactical Liaison and Equipment. A licensed psychologist rounds out the group and provides insight to behavioral or mental health issues. 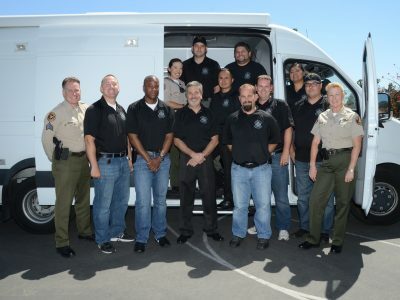 Besides serving as negotiators, all team members hold regular, full-time positions within the Sheriff’s Office. Currently negotiators are assigned to positions in Patrol Services, Investigations, Detention Services, and Communications. Members of the Tactical Negotiations Unit can be recognized by the emblem worn on their uniform pocket flap. The icon is a ‘Fusil Cross’. It is derived from British Heraldry and signifies four fusils of yarn joined together in agreement.